Last edited by Caribbean Traveler on Mon Jun 30, 2008 11:22 pm, edited 2 times in total. Boris was named officially earlier today. It poses no threat to land. 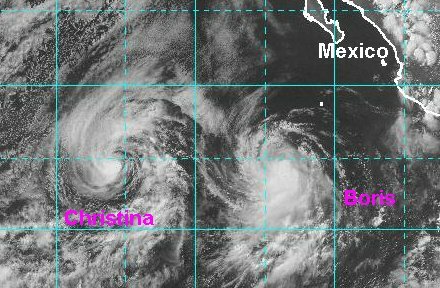 It should generally move west away from Mexico and probably stay as a storm. It has a deep brust of convection around the center at this time. Boris has been tracking slightly south of the NHC official track and is moving more w-nw than nw. It is still a solid tropical storm that is posing almost no threat to Mexico. Only a slight increase in swell may be noticed on the west coast of Mexico. The official NHC track was adjusted a bit farther south, on the trend that we noticed from our last update. Their new track is mostly west in which we concur. NHC is also calling for little strengthening, but the I.R. satellite imagery from the last several hours is showing Boris ungoing a deep convection burst. 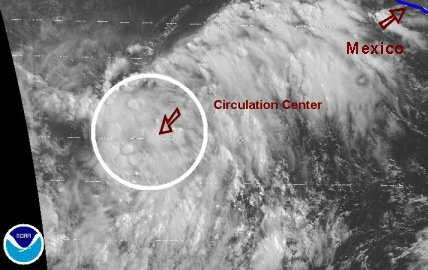 The center of circulation in under most of the convection. With this being the case, we think Boris is probably going to strengthen a little before leveling off again after this phase is over. 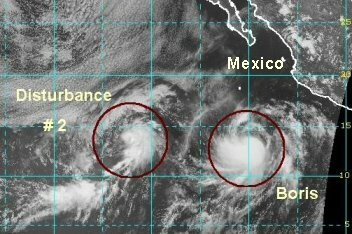 Boris is well out to sea, and only an increase in swell may be noted on the coast of Mexico. The deep convection burst over Boris has leveled off and it now appears that Boris is facing some shear. The northern part of the low level circulation has been exposed. With this being the case, a decrease in intensity is now likely as Boris continues well away from land. 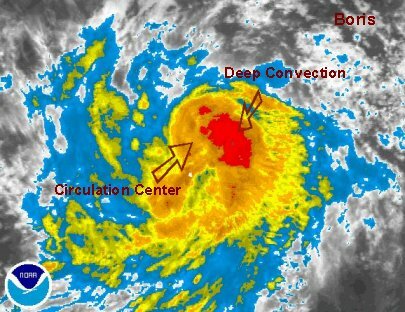 Boris has fought off the shear and convection has rebuilt over the center of circulation. The net result was very little change in intensity after maybe some minor weakening last night. Boris will continue to move in a mostly westerly direction with little change today. Boris has changed little today. It is over 700 miles southwest of Cabo San Lucas, MX. There is nothing that looks like it should effect Boris is any substantial way soon. Expect Boris to still move west with little change tonight. Boris is getting better organized. 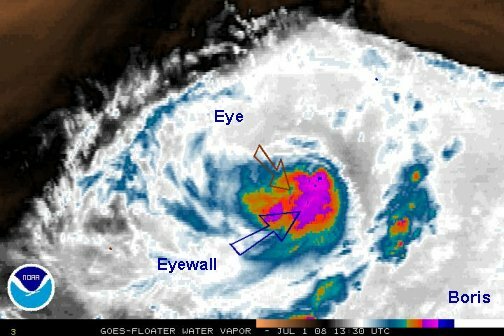 The latest satellite imagery shows eyewall development. With this being the case, it should be near hurricane strength. Forecast models keep it west for a few days then stall it as it hits a ridge of high pressure. Beyond this time frame it may move a bit south of west around the ridge again. This is a delayed report. We had server problems overnight. 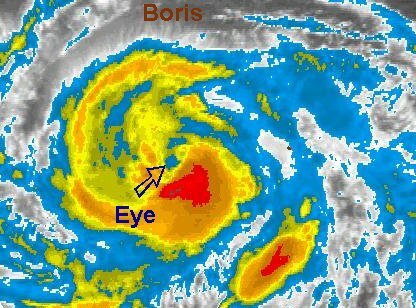 The Tropicalweather.net Tropical Pic showed last night that by 8-9 pm edt Boris had an eye. Also, satellite wind speed estimates were above hurricane force. One estimate was near 76 knots! The satellite image is from 2am edt. NHC named Boris a hurricane at 5 am, at least 12 hours late, but the right call. 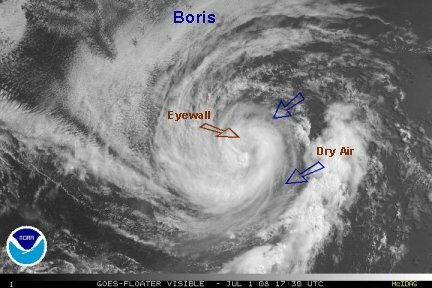 The water vapor imagery shows Boris with an eye feature still. The strongest eyewall remains on the south side of the circulation. The advanced microwave sensing estimate still places the strength at 76 knots and another satellite estimate at 73 knots. So, the strength is probably a bit above NHC's 75 mph. 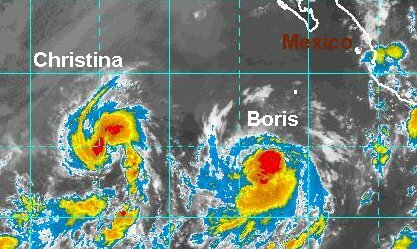 Boris remains no threat to Mexico and Hawaii. 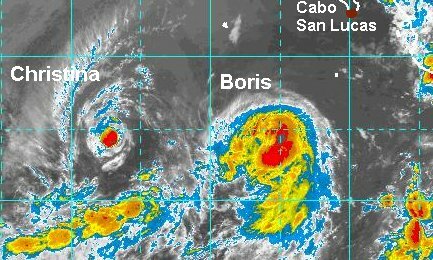 Boris is losing a little intensity and is a minimal hurricane. Microwave and Quickscat satellite wind estimates put Boris near this strength. Some dry air is near the circulation center and may significantly disrupt the strength if absorbed into the eyewall. We expect Boris to drop down to tropical storm strength within 12 hours, or maybe less than 6 hours if the dry air is ingested. 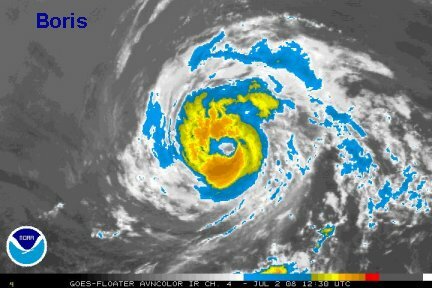 Boris is a fighter and has ungone rapid intensification. NHC at the 11pm advisory took Boris down to a 70 mph tropical storm. The latest microwave and I.R. satellite imagery has shown over the past 4 or 5 hours development of the eyewall - in fact the most impressive that Boris has looked yet. We would estimate that Boris is around 80-90 mph at this time. Boris continues to not be a threat to land. Boris is cranking. The NHC 5 am advisory put Boris at 75 mph. The latest microwave satellite estimate is 93 knots ! Boris must be at least 90 mph looking at the imagery. 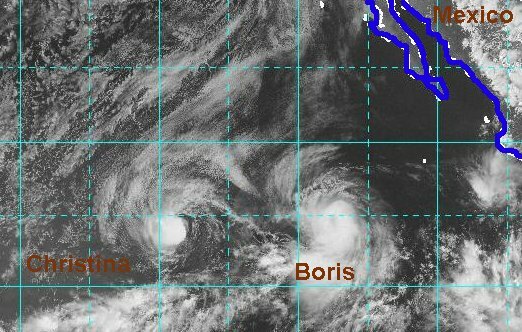 Boris is gradually heading toward cooler water so should weaken. We thought that yesterday too. The NHC 11 am advisory just came in and kept Boris at 75 mph. 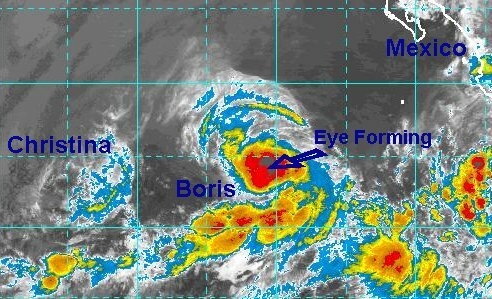 The eyewall cloud tops around Boris are finally warming. No doubt NHC will drop the top winds down at the 5 pm advisory and call this a t.s. again. Top winds are probably in the 70-75 mph range and decreasing. 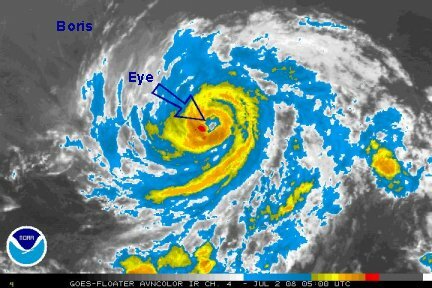 Boris has lost its eye awhile ago and is definitely decreasing in intensity. NHC's last advisory had Boris at 60 mph which looks reasonable. 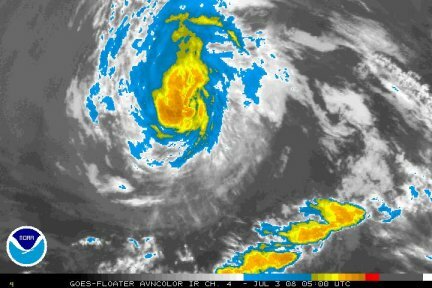 This sytem should be next depression status in the next 24-36 hours.